How Do I Know I Have Subterranean Termites? 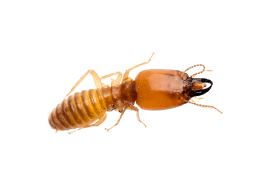 By the time you see subterranean termites inside your house, chances are you already have an established termite infestation. If you think you might have termites we highly recommend contacting a termite inspector to perform an inspection either of the entire house or of the area of concern. A specialized termite inspector from Knockout Pest Control and Termite Control comes to your property to conduct a comprehensive termite inspection. The termite home inspection report details the lists of findings from the termite inspection, including locations of subterranean termite activity, dry-rot and fungus damage and other associated termite damage. After identifying the source of termites and the extent of the subterranean termite activity, the report recommends termite control treatments. The termite inspection report then outlines steps for subterranean termite treatment and wood damage repairs. Local treatments for subterranean termite control are specified for the individual locations shown to have a subterranean termite infestation. We are a Termidor registered partner and we proudly use only Termidor for subterranean termite treatments. We do full treatments and local termite treatments using Termidor, the number one product on the market. This type of termite treatment creates a barrier that remains over time. It has a transfer effect from one subterranean termite to the other. Once the termite control chemical is encountered by a single subterranean termite, it can transfer for up to ten cycles. It has a compounding effect that leads to total termite eradication and the best termite protection. Termite infestations, dry-rot, and fungus can compromise the integrity of wood components in and around your home. Because of this, wood repairs are often required to restore the structural integrity of your home or building depending on the length of infestation, the type of termite infestation, and the extent of the infestation. Knockout Pest Control and Termite is unique among termite exterminators. We employ licensed, experienced tradesmen and carpenters. Because of this, we are able to repair and restore your structure efficiently and correctly. When termite wood damage makes structural repairs necessary, our customers can be confident in our experienced carpenters and licensed tradesmen to perform flawless structural repairs. Our licensed crew completes small wood repair jobs following termite damage, as well as larger scale wood damage repairs like deck re-builds and structural beam replacements.